Sparkling with wit and wisdom, this classic guide to sermon preparation and delivery has been fully updated and enhanced to help preachers speak to the markedly different world of the twenty-first century. An essential preaching resource. 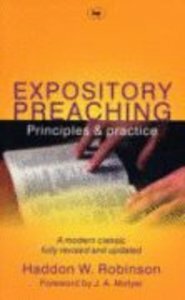 After defining expository preaching, Robinson presents a ten-stage process of sermon development, showing you how to get from the text to the sermon, decide its purpose, shape an outline and preach it so that people will listen. Haddon W. Robinson (Ph.D., University of Illinois) is the Harold John Ockenga Distinguished Professor of Preaching and Presdent of Gordon-Conwell Theological Seminary in South Hamilton, Massachusetts. His book, Biblical Preaching, has sold more than 200,000 copies and has been used extensively in Bible colleges and seminaries since 1980.